Welcome to the Autumn 2012 Weird World column and the latest round-up of news and views on the unexplained, the weird and the wonderful. In a particularly poignant development, given my friendship with the late Georgina Bruni, who founded of Hot Gossip UK, I recently signed a deal with St. Martin's Press to write a book on the Rendlesham Forest incident. Georgina, of course, wrote a book on this fascinating UFO case, entitled You Can't Tell The People. Now, over 12 years after Georgina's book was published, I've teamed up with the two witnesses at the heart of the incident - John Burroughs and Jim Penniston - to write what we hope will be the definitive account of a UFO case that is probably more significant and compelling than the Roswell incident. Rendezvous at Rendlesham will be published in 2013. 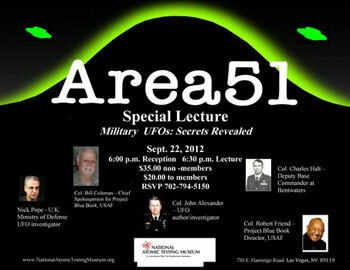 On 22nd September the National Atomic Testing Museum in Las Vegas held a unique panel discussion on UFOs. The panellists weren't ufologists, but people who have investigated UFOs officially, for either the American or British Governments. The participants were Col. John Alexander, Col. Bill Coleman, Col. Robert Friend, Col. Charles Halt and me. Two of the US participants were involved in Project Blue Book, the United States Air Force UFO investigation program. Though not on the same scale, the British Government's UFO project was based on Blue Book - the terms of reference and the investigative methodologies being virtually identical. This was a unique opportunity for me to meet some of my US opposite numbers and to compare and contrast MoD's UFO project with the US Government's program. I also used my presentation to give an update on the ongoing work to declassify and release MoD's entire archive of UFO files - a process in which I've been closely involved and which is nearing its climax. The National Atomic Testing Museum is affiliated with The Smithsonian and the event attracted significant attention from the mainstream news media. The UFO community were less enthusiastic. Die-hard skeptics asked why a Smithsonian-affiliated institution was hosting a UFO panel, while true believers complained that all the panellists were ex-government or military personnel who had investigated UFOs not as their hobby but as their government job. Ironically, therefore, the believers answered the question the skeptics posed. As someone who broadcasts and writes about both the scientific search for extraterrestrial life and about ufology, I'm dismayed by the lack of understanding between the two groups. First off, unless they've studied the phenomenon, astronomers are no more qualified to talk about UFOs than ufologists are to talk about, say, titanium oxide production in K-type stars. It's like marine biologists and oil company executives saying they understand each other's fields because they're both looking for something in the sea. The sea is about the only thing they have in common. So it is with astronomers, ufologists and the sky. The ironies can be amusing. The SETI community and the UFO community, for example, are looking for the same thing, but in totally different places and ways. SETI scientists deride ufologists as kooks, while ufologists criticize SETI for looking for alien life 'out there', when they say it's much easier to find it down here. A slightly more sophisticated ufological criticism of SETI is that searching for radio signals from other civilisations is a search strategy based on a very anthropocentric assumption. A rare example of someone with a foot in both camps was the late Dr J. Allen Hynek, an astronomer who was appointed as the scientific adviser to the United States Air Force's official UFO investigation program, Project Blue Book. He later became active in the UFO community and argued that the subject was worthy of proper, scientific research. I agree, especially where one has, for example, photos, videos or radar data - because such things can be studied in a proper, scientific manner. It's unscientific to ignore data simply because it doesn't fit your worldview. Clearly there are some cranks and charlatans in the UFO community, but having attended the two 2010 Royal Society discussion meetings on the discovery of extraterrestrial life (The Astronomer Royal, Lord Rees, chaired some of the sessions) I suspect ufologists would have found some scientists' views a little far out: civilisations migrating towards black holes to tap the energy; "immortal thinking machines" being the dominant life forms in a largely "post-biological universe", etc. Huffington Post correspondent Lee Speigel - one of the few journalists to routinely cover the UFO phenomenon - incorporated some of my remarks into a feature he wrote about astronomers' views on UFOs. Click huffingtonpost.com to read the feature. In recent columns I've highlighted the idea that the world will end on 21st December 2012, as many people believe is predicted by the Mayan calendar. As a broadcaster and journalist who often covers the unexplained, I've previously been commissioned by The Sun to write a major newspaper feature on the subject, giving an overview of the various theories. This in turn led to my being asked to do various TV and radio interviews on the subject. Expect interest in this topic to build further as 21st December approaches. I'm sceptical that anything unusual will happen, let alone that the world will end. As with all the hype over Nostradamus and The Rapture, as long as one doesn't take these sorts of predictions seriously, they're a bit of fun and a nice excuse to hold an end of the world party. But there's a dark side to this. Some people are genuinely frightened about this and other people are exploiting this and spreading misinformation. So by all means take an interest in the Mayans and watch a few TV documentaries about all this, but rest assured, the world won't end on 21 December, just as the world didn't end on all the other dates that have been the subject of previous predictions. So don't have nightmares and don't think you don't need to prepare for Christmas! You do! If you want some fun, treat it as a joke and organise an end of the world party. Click on The Sun to read my feature in The Sun. As regular followers of this column know, in January 2011 I relocated to the US, following my marriage last year to a US citizen. Some things in my life have changed a lot, while others have stayed the same. We spend our time between San Jose and Tucson, so climate is much better than it was in the UK, as is the standard of living. I'm also driving again (a Buick), and while driving an automatic is much easier than driving a car with gears (a stick shift, as they call them over here), driving on the right hand side of the road takes a little getting used to - though it's rather important! Work wise, I'm still doing a mixture of broadcasting, freelance journalism and promotional work. I've lost a little work by virtue of not being in London, where I was able to get into a taxi and get to a BBC, ITN or Sky News studio to comment on a story within an hour of getting the call. However, I've probably picked up more TV work by virtue of being a short hop away from LA - a plane journey that's getting so familiar I could probably do it with my eyes shut. I have various bigger projects in the pipeline, which I hope to be able to announce shortly. For those who want to check up on my latest news more frequently than my columns here, check out the Latest News section of my www.nickpope.net website, follow me on Twitter under the name @nickpopemod or subscribe to my official Facebook Page at the facebook.com/nickpopeofficial link. Author, journalist and TV personality Nick Pope used to run the British Government's UFO Project and is now recognised as one of the world's leading experts on UFOs, the unexplained and conspiracy theories. Check out www.nickpope.net for more information about Nick.